As we move ever closer to the brave new world of a digital planet we still live in a society replete with junk mail, old posters, discarded magazines and paperback novels tactile reminders us of a different era juxtaposing the new. Two generations looking at each other, exchanging glances while morphing from one world into another. 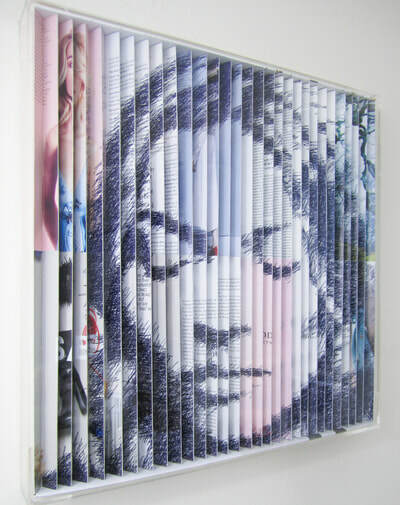 Any printed media that’s served its purpose goes straight into the recycle bin….right!, all those articles, stories and images that once burst off the page and into our lives to be shredded then pulped never to be seen again - well not in Artist Paola Bazz’s home. They are rescued and become the raw ingredients that will be transformed into her art. Paola takes recycled card cuts, manipulates and turns it into strips and paper pixels then re-uses them to recreate photographs of faces into collages that have an enigmatic surreal quality to them. The phrase the whole is greater than the sum of its parts really doesn’t go far enough, when it comes to her work paper alchemy seems an apt way of describing what she does. I recently had the privilege of making a short film about Paola’s work which gave me a chance to view her original art works in all their glory and talk about her process. I first met her in her studio she works out of at home. My first impression of Paola was that she had a very friendly calm disposition. Later on however as we spoke further about her work I began to see a deeper more impassioned side to her as she described her thoughts about her process and philosophy behind her art. 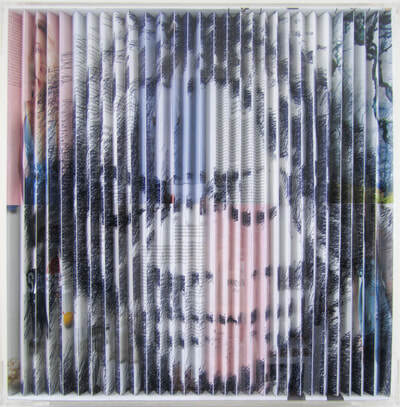 Paola’s work is almost exclusively images of faces some well known some not. It started to become clear the more we spoke whoever the image is of all have one thing in common each one is not just an artistic process but a psychological one too, something she says she is not consciously aware of while creating a piece of work but can see a clear correlation between how she felt during the process and the sense of emotion from the face looking back at her by the end, which is often quite different from the emotional quality of the original source photograph. My first encounter with one of Paola’s works was called ‘Black and/or white.’ Paola showed me into her front room and went off to the kitchen to make coffee, as I looked up there was an image of a face that had such power that I couldn’t take my eyes off it. 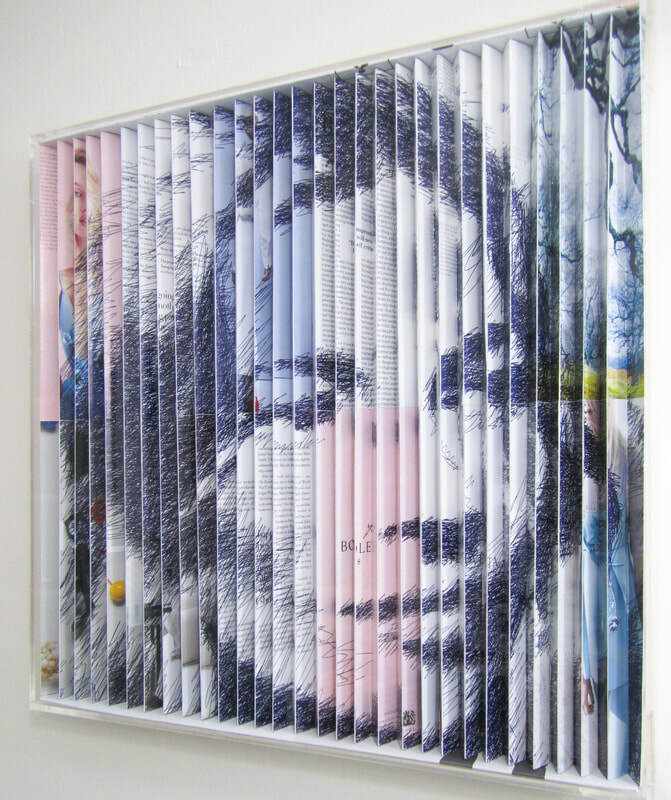 I’d seen the same work on her website but was surprised by the power of it in the flesh. At 1.5m x1.5m it was an imposing presence in the room, I sat in silence gazing at the face. 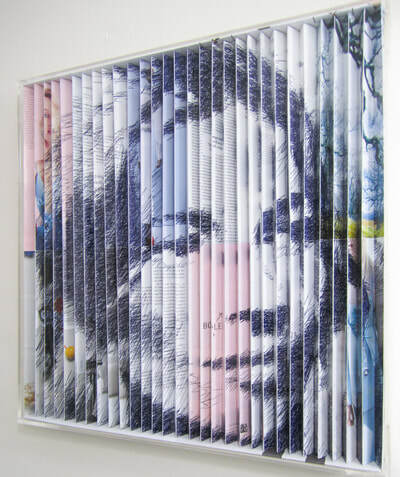 Made up of hundreds of paper pixels it seemed to be two halves of different faces blended to make one powerful image or was it one face expressing two identities? As time went on the face began to change and take on different qualities, Paola’s work has an ambiguity that gives us the room to generate our own meaning, we become active participants in her work whether we like or not. I approached the face for a closer look. It began to distort and change it’s nature the gaze becoming more intense, then as I moved in even closer the face seemed to disassemble and I started to see its component parts, the paper pixels that made the work, all these smaller images and stories folded into her work like hundreds of tiny subplots to the main narrative. As I looked at these fragmented images of faces, people, objects, text and patterns now cut off from their original context, it struck me how each of these images contained it’s own story it’s own intent, each image a thread to another world to its previous life but now transmuted into Paolas work to tell a different story. All those hands and thought process’s each article or advertisement had passed through from conception to completion to eventually take the physical journey and arrive at Paolas studio, to me it illustrated how we are all connected how nothing exists in isolation. “Make visible what, without you, might perhaps never have been seen” – is a quote from French film director Robert Bresson. For me this applies to the faces that Paola creates. She can take a photograph of a person and through her art transform it almost like she’s delved into the psyche of that very person to reveal something new to her and to them. It’s no accident that I used a quote from a film director, because for me Paola’s work has a cinematic quality to it, like cinema it has an audible quality. When I look at her work I hear it. As I sit and observe her work all the elements become different sonic frequencies creating a kind of subtle tension, then as you stay with the image the sounds begin to harmonise and you begin to hear the music as a whole. All these tiny images resonating together like the teeming voices of our collective consciousness talking back to us in the form of a human face. The parallels with cinema continue with the sense of motion in the image, the faces seem to be moving or eager to go somewhere explore something beyond the edge of the frame. 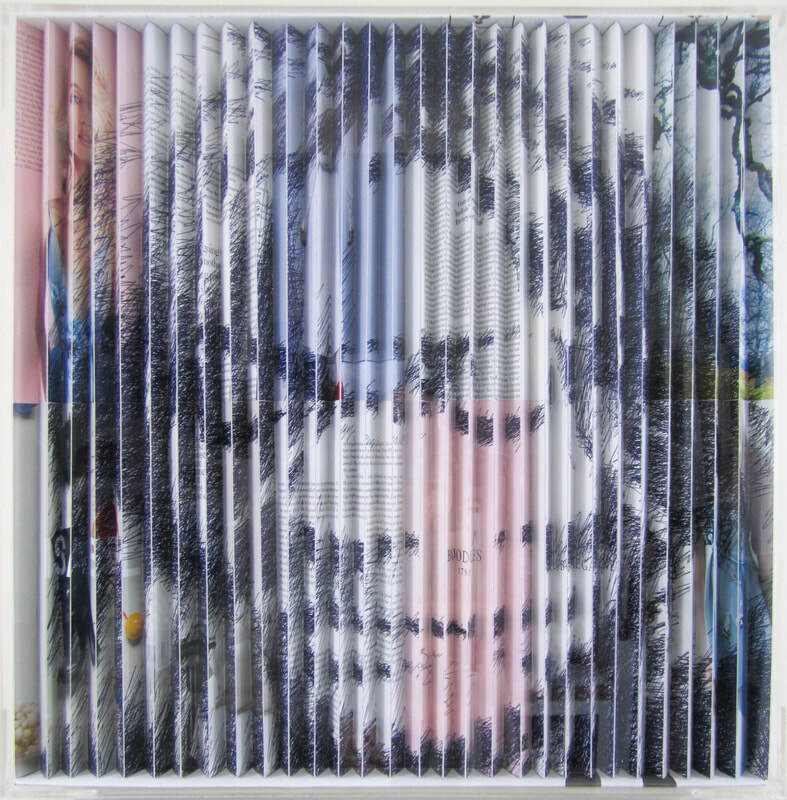 This is even more evident in her recent work particularly Beyond my face #1 and What Now_#1 these 3D collages utilising strips of card capture a feeling of movement the face literally changing as you walk around it revealing hidden expressions and faces. Just as the auteur film director is in control of their cinematic universe wielding the ability to fracture time and space to create a hyper reality for us to inhabit, Paola brings this same sensibility to her work. Whether it’s someone famous or an unknown face Paola chooses to recreate they all seem to share an eternal quality. Paola’s work has this ability to touch upon that world just beyond our senses her faces peering out almost from another reality looking through the expanse of time at us watching them. For me Paola’s art is an invitation to participate in the outer and the inner world, as soon as you start gazing at one her pictures you’ve already accepted the invitation even if you don’t know it quite yet. For a closer look at Paola's work check out the short film Paola Bazz Artist.